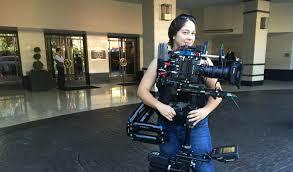 Steadicam operator and Local 600 member Jessica Lopez talked with us about her work with Steadicam rigs. Lopez takes pride in what she does. “One of the best experiences on set was shooting my first ‘oner’. It was an eight-minute shot that took place in a one-story house. It involved a wife coming home catching her husband wearing her lipstick. Lopez says shot rehearsal is critical. “It took us a day and a half of non-stop rehearsals to nail down all the acting key points and all the Steadicam moves. Even today it is still one of my proudest jobs because of the challenge and the praise I received from the cast and crew. With the many camera options available, we asked Lopez how she maintains familiarity with them all. “Honestly, I believe the First AC (Assistant Camera) is the one required to maintain more familiarity with any camera than an operator. I consider myself a ‘frame watcher’. I understand camera functions, features, navigating menus, etc. But I make sure to refer to assistants that have an encyclopedia of various cameras filed in their minds. I care mostly about the user-friendly features, the mass, and accessories. Just give me the camera and I will keep them in the frame compositionally and aesthetically. Lopez’s path to becoming a Steadicam operator was the opposite of most. “Ha, I think I am one of the few that actually started backwards,” says Lopez. “I started off in Steadicam, then moved into cameras. I know, weird. Most guys start off in the industry as grips and assistants before moving into Steadicam. Not me, I went straight to the source. “Out of college I was fortunate enough to start working for Tiffen Steadicam. Learning the anatomy, assembly, and packing of a rig was the best knowledge I had ever received. Even dealing with customers taught me so much. Guys would bring rigs in from sets around the world. It was so exciting getting to meet a lot of the veteran operators out there. 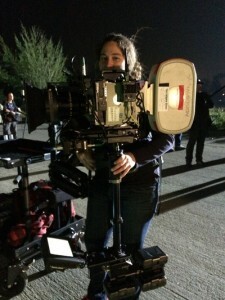 A woman Steadicam operator is relatively rare. We wondered what’s that like. Do you have to go further to prove yourself? “Hmm, being a female Steadicam operator has its ups and downs,” Lopez says. “Yes, I am in a small group, which is excellent. I love being part of that small group. I grew up an Army brat, with mechanics and sports. So I feel most comfortable in a female-challenging role in a male-dominated profession. “The worst part about it,” she says, “is I get overlooked a lot. Say someone hands a producer a list of Steadicam operators and on there my name is third on the list, saying ‘Jessica Lopez’, among Bob, Joe, Jimmy, Larry, etc. Because it’s a feminine name, automatically I get passed on the list. Why? Because I’m a woman, I can’t carry a rig, I can’t be that good? “There are six-feet tall, big, muscular men that I sometimes get called to come in and replace. Why? Hmmm, let’s see. First I hear about their attitudes and how they won’t listen or won’t fly an extra three pounds on their sled. “So yes, I have to prove myself time after time,” Lopez says. “Mainly I’m not seeking approval of others in order to be a good operator. I seek feedback, support, and guidance. “The most supportive people in my life besides my family are my mentors. Some people have one mentor, I have five. All seasoned Steadicam operators that have been doing Steadicam for decades that want to see me push through and be one of the best. They are my lifeline. See Jessica Lopez’s film reels and resumé.